For a "fantasy" themed landscape quilt challenge over on Valerie Hearder's yahoo group. Why yes, I am getting a little tired of the eternal winter around here-- gray, dark green, shadows, and rain-- so this is where I went to in my own personal fantasy. The exact opposite, hot and parched. Is that an oasis in the distance, or am I hallucinating from the heat? This is a small quilt, about 10-11 inches by 11-12 inches, and uses a variety of hand-painted fabrics and commercial quilting cottons. The shading on the dunes was painted by yours truly using Shiva paintstiks, and the dunes were appliqued down using a fusible web. 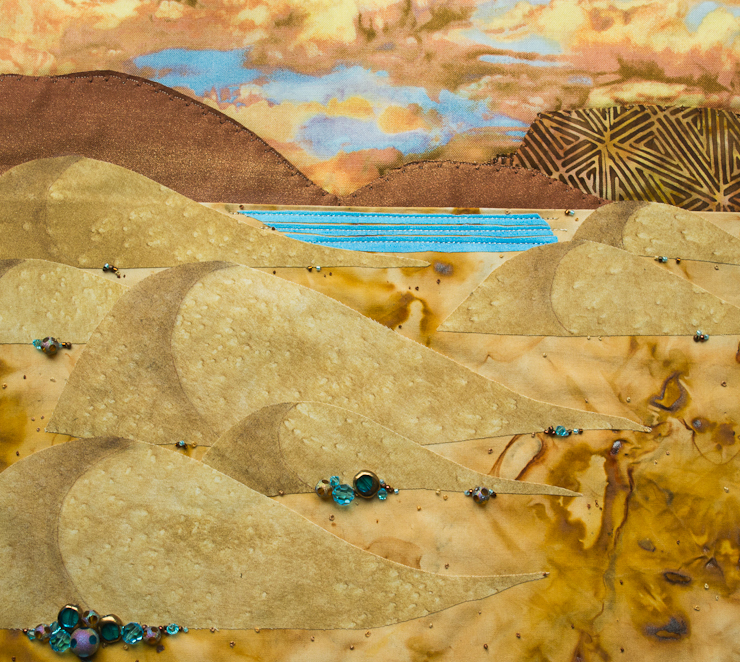 I hand embroidered some tiny french knots to add texture to the "desert floor" and machine top-stitched the distant mountains and water of the mirage using metallic machine threads. Then I added beads because I can't help it, it's gotta have bling. quilt challenge? So how big is this? It's lovely, I'd love to hear more about how you did it.